I know it's been 3 months since my last post, but I've been bitten by this terrible lace knitting bug and literally have not stopped knitting lace since mid June. Well I did stop to fill orders for Infiknit and of course, June and July were very busy months. Then I was on holidays in August for two weeks - more New York city and our annual trip to Hilton Head SC. All strung together with lace insertions. 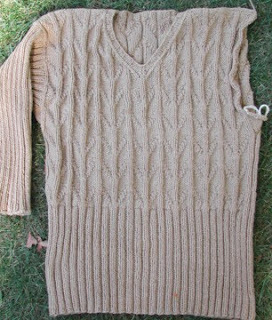 Yes I am still knitting Gifford - nearly done - just one sleeve to go - unless someone can find me a one-armed bandit and then I would be finished!! It all started with that awful book - Victorian Lace. I might not have given lace knitting a second thought, if I hadn't seen Cambridge again through "lace coloured" glasses and I had to go there - in my mind! Also there were these odd sized balls of lace weight yarn which I couldn't really use for orders and didn't want to discard so I thought - "What harm would a little swatching do"....... lots. Now I do nothing but SNIT - knit with such concentration that I am no longer pleasant company in the evening because I am always counting stitches or rows! 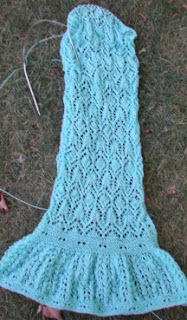 I suppose there are worse things - perhaps I'll give it a rest - just after this next scarf...I'll think about it. Anyway - here are some pictures . Top right is a scarf and shawl both started at the outside edges and joined with a three needle bind off in the centre. On the left is a scarf with a centre provisional cast-on and worked down to the end. I am well over half done here and may do the shawl version and at left is Gifford which was really fun to knit because I just made a few mistakes which were easily corrected. I'll be assembling my woolly board soon to block Gifford- it looks like you need an engineering degree for that, though, so I have been putting it off. Finally, I have been watching for an update! 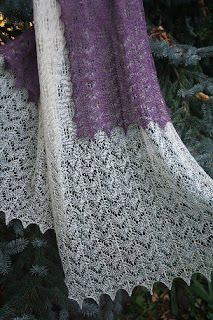 Your lace is wonderful and Gifford is looking very good. Look forward to more frequent updates!